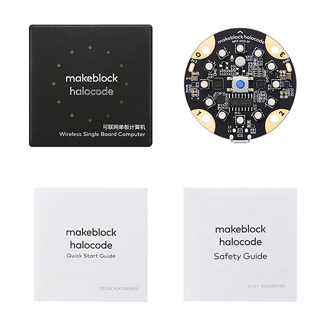 Makeblock HaloCode is a single board computer with built-in Wi-Fi. Designed for programming education, its compact design integrates a broad selection of electronic modules. 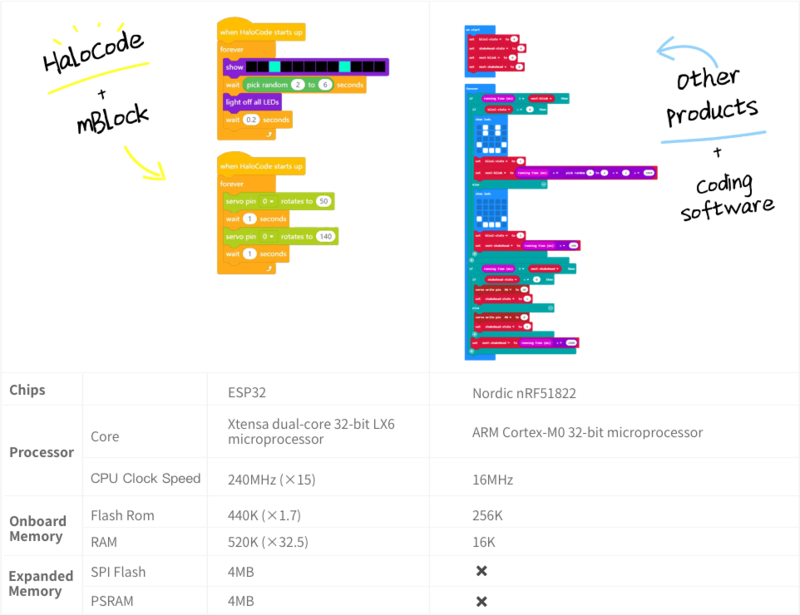 Pairing with block-based programming software mBlock, HaloCode offers all sorts of opportunities to experience AI & IoT application with just a few clicks; it makes creation easy and fun. Easy IoT1 applications: Using mBlock software*, students can connect to the Internet in just 3 simple steps. mBlock makes it easy to use IoT applications and create simple, smart home devices. 1. IoT, or the Internet of Things, refers to an interconnection via the Internet of all devices, enabling the digitisation and management of all kinds of smart devices and facilities. *Available soon on Mobile ends. LAN2 functionality: Different Wi-Fi modules enable “wireless” or even “limitless” connections between multiple HaloCodes, meaning they can provide creative effects such as dreamlike digital art. 2. LAN, or Local Area Network, allows devices to connect and communicate with each other without routing. Featuring a microphone module and supporting mBlock-integrated Microsoft Cognitive Services, HaloCode makes AI speech recognition super-easy to use. Students can learn to apply this cutting-edge technology by creating a fun, interactive playmate or voice-activated device. Offering all sensors needed to lead HaloCode “sensory”, a variety of sensors are embedded onto a circuit board with only 45mm in diameter. Thus, HaloCode can respond to touch, sound and movement via programming. 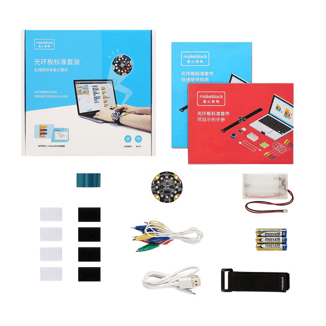 An ideal elementary device for your electronic projects such as a wearable fitness watch for step tracking. 4MB of memory and an Xtensa dual-core 32-bit LX6 microprocessor empower HaloCode powerful computing capabilities. It puts the “creative” back in creation, by allowing multiple programs to run simultaneously and synchronising complex and diverse functions. For example, an art installation of a kitten that simultaneously blinks and wags its tail. ▲ The powerful specs of HaloCode enable multiple sub-programs to run simultaneously. With mBlock, a few lines of code are already sufficient for making a playful gadget with various functions (left). For other similar products on the market, support usually single-thread programming, complicated layout and arithmetic logic are required to achieve the same gameplay (right). 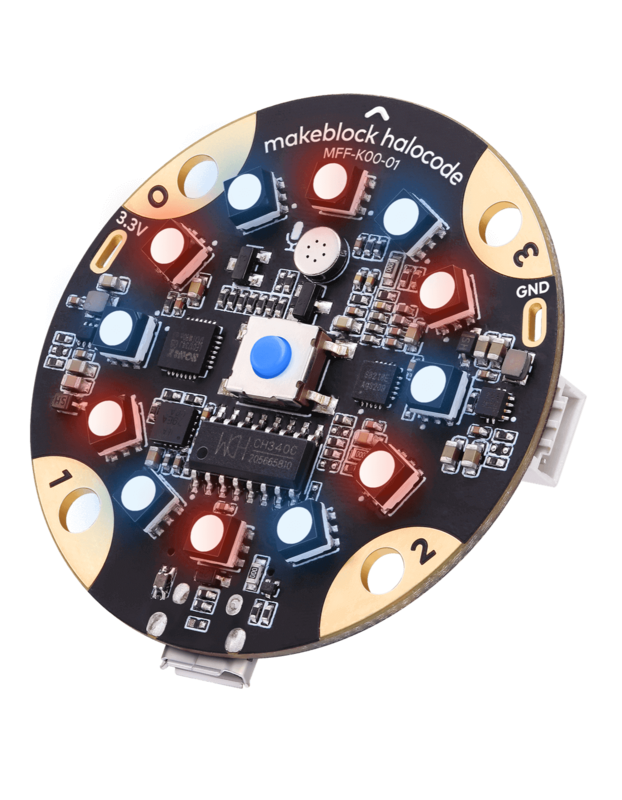 Designed explicitly for coding education, HaloCode works perfectly with programming software mBlock. Students can drag and drop the command blocks to code, making programming as intuitive and straightforward as playing building blocks. 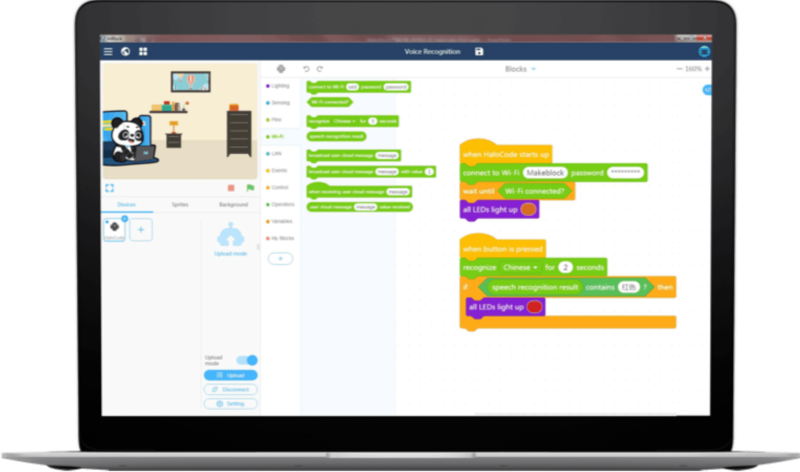 Mastering coding logic quickly enables students to focus on what’s most important during making: creativity. After grasping how to program with blocks, you can effortlessly convert to Python coding with just a click in mBlock. It displays the relationship between the two languages and shows the changes in real time. For more playful ideas together with mBlock and HaloCode, you can code directly in the Python editor. Step up to text-based coding empowers creations with higher degrees of freedom, endless possibilities. In addition to using Microsoft Cognitive Services, students can also get to machine learning through mBlock’s integrated Google Machine Learning application. HaloCode provides all-round support for students’ first experience of artificial intelligence. HaloCode encourages students to use everyday items to create electronic projects. For example, they can design a video game through mBlock, then use HaloCode to bridge both the game and any real objects as a joystick to control the game. Wielding hardware and software to an fun and educational ensemble to experience the wonders of electronic technologies. HaloCode supports 60+ external sensors and electric modules*. Plugging with specific modules into one, HaloCode can be further used to meet the teaching needs of applied science, such as illustrating the working principle of a light, heat or soil humidity detector. Students can freely explore scientific applications through creating a smart curtain, a Fire warning device for people with disabilities, or even a greenhouse ecosystem. Halocode is avaliable for purchase seperately. 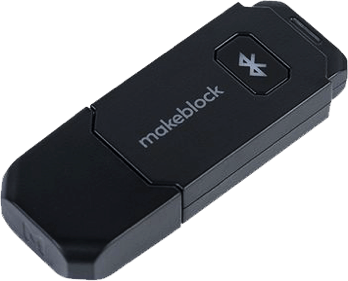 For transferring program wirelessly to HaloCode via your computer and experience a more intuitive programming effect, Makeblock Bluetooth Dongle can help.